A black and white negative of a portrait of Mr. Leslie Harry Inkpen. Leslie Harry Inkpen was born at Sturminister-Newton, Dorset, England, on December 27, 1909 and came to Whitby in 1951. He was a Lieutenant-Commander in the Royal Navy in charge of 16 landing craft at Juno Beach on D-Day, June 6, 1944 and President of the Royal Canadian Legion Branch 112 in 1959. 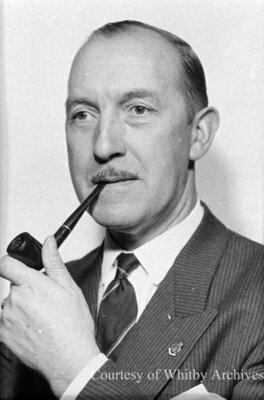 He served on the Whitby Town Council from 1958 to 1961 and 1965-66. He was a life member of the Legion in Whitby and an acting Padre in his later years. Mr. Inkpen was Master of Composite Lodge AF and AM in 1962 and a charter member of David T. Campbell Lodge the same year. He was Chairman of the building committee for the new Masonic Hall in 1963. He was Chairman of the Whitby Branch of St. John Ambulance, President of the Whitby Boy Scouts and a Sideman, Warden and lay reader at All Saint's Anglican Church. Mr. Inkpen was named the winner of the Peter Perry Award as Whitby's Outstanding Citizen of 1983 and received an Ontario Bicentennial Medal in 1984. He was an Accountant and Training and Fire Safety Officer at Dunlop Tire in Whitby. Mr. Inkpen died at Whitby on June 5, 2001 and was buried at Groveside Cemetery, Brooklin. Leslie Harry Inkpen, 1959, Photographer Unknown. Whitby Archives A2016_017_035A.